There are countless possibilities for digitally distributing content, but getting people to engage is the tricky part. The one thing almost every target audience has in common is limited time and patience. But even if you manage to pique a user's interest with a compelling story, you only have seconds to make an impression... and if you don't, their attention is gone. This is where visual storytelling through media becomes at once essential and the biggest potential pitfall. A 1-second delay in web page loading time results in an 11% reduction in page views and a 7% reduction in conversions. An optimal user experience is crucial, and has a direct impact on engagement and conversion. Cloudinary can't help you with the tough task of getting your story right, but we can help ensure that your execution is perfect. Cloudinary started out as an API-driven image management service targeted at web developers, gradually expanding support to video and virtually any form of media. We then started getting requests from other teams involved in the media asset management process. This made us realize the benefit of having all teams working and collaborating on a single platform, throughout the whole media lifecycle - from upload to delivery. We are now excited to officially launch the Cloudinary end-to-end Digital Asset Management solution, which enables creative, marketing and development teams to realize the full value of their assets. It's a platform that will not only streamline your asset workflows, but also optimize end-user experiences across all touch points. Let's say a photographer uploads images from the latest event or from a recent photoshoot. Designers work on them, media managers review and comment, and then a supervisor approves. So far, it's a (relatively) smooth process. But now you need these images in different shapes and sizes and distributed across different channels, as soon as possible. And you want every one of these variants to look good on every kind of device, oh, and load fast too of-course. At this point in the life-cycle, your assets become the responsibility of another team, which generally means a different system, inconsistencies in process, and increased cost. The assets become difficult to track, and making changes at this stage becomes a daunting challenge. A seamless asset lifecycle with a consistent visual experience, that extends beyond internal operations. A collaborative team that works together on a single cloud platform. True insights on actual content performance, which can be continuously tracked and improved. Shorter time-to-market with automated processes. A completely revamped Media Library, re-designed with both developers and creative, marketing and other non-developer teams in mind (and more fun to work with too!). It's built on top of our resilient platform, so you can scale as you need. 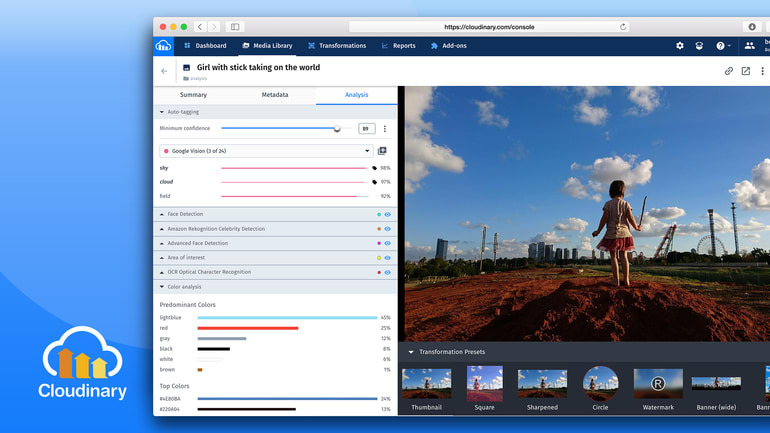 Extensive tools and visualizations for AI-powered image analysis, including face detection, color extraction, content and celebrity recognition, and OCR, all of which you can take advantage of for both automated manipulations and advanced search. Extended integration options including a robust API, a new and improved upload widget enabling your end users to upload user-generated content, as well as a new embeddable Media Library UI widget that allows your teams to easily browse, manipulate and select the most relevant assets from within your organizations' CMS tool or other web apps. We're proud to launch our new Media Library UI, with an elegant modern design, a refreshed color palette, and a responsive layout that auto-adjusts to your screen size. But it's not just about looks; our new Media Library also provides a better user experience designed to help you carry out your management tasks efficiently. Upload any type of asset from any source: local drive, URL, cloud drives, or social networks, or drag & drop directly into the Media Library using our new Upload Widget. Don't forget to take advantage of advanced options for manual or automatic tagging during upload. Organize and browse assets with intuitive folder navigation. Easily select multiple assets for performing actions such as tagging, downloading, deleting, or organizing them in folders. Also, we now offer a preview of each asset for quick editing of tags & metadata while browsing. Search for assets through any combination of criteria such as tags, custom metadata, format, resolution, aspect ratio, colors, faces, location and more. Manual work is a hassle, and when handling masses of assets, sometimes impossible. Without any manual effort, the new asset management page gives you real-time automatic insights on your assets, including built-in face detection capabilities, auto-tagging, face & celebrity detection and OCR. You can now visually experience all these using the Asset Management Analysis tab. And don't miss the transformation presets that enable you to quickly browse through a variety of ways that Cloudinary can automatically resize, crop and adjust your images to fit your graphic design. Instead of manually creating multiple versions of assets, all you have to do is review them. Many of our customers are already using our robust APIs in a variety of frameworks to integrate with their business technology ecosystem: content management systems (CMS), product information management (PIM) systems, project management tools and more. It's also very easy to extend the Cloudinary platform using notifications and webhooks to enrich metadata or create flexible automated workflows. Our Upload Widget allows any contributor – photographers, designers, agencies and even end users – to upload assets directly to your account. Additionally, we are happy to introduce a new Media Library UI widget. Integrating this responsive widget (with only a few lines of code) will provide all the great stuff available in the Cloudinary console Media Library, embedded directly into your business application. That means your business users can now interactively search, browse, select and manipulate assets directly from your Cloudinary account and insert them in a way that matches your application design guidelines and flow, on any device. We also provide various user roles, allowing you to define viewers with read-only permissions, or contributors with upload permissions. Combined with our SAML-based SSO support, you can fully control access to your assets. ... give a DAM to all your teams: designers, content managers, media managers, marketers, developers, and IT. Each team will get the user experience they need without the compromises. 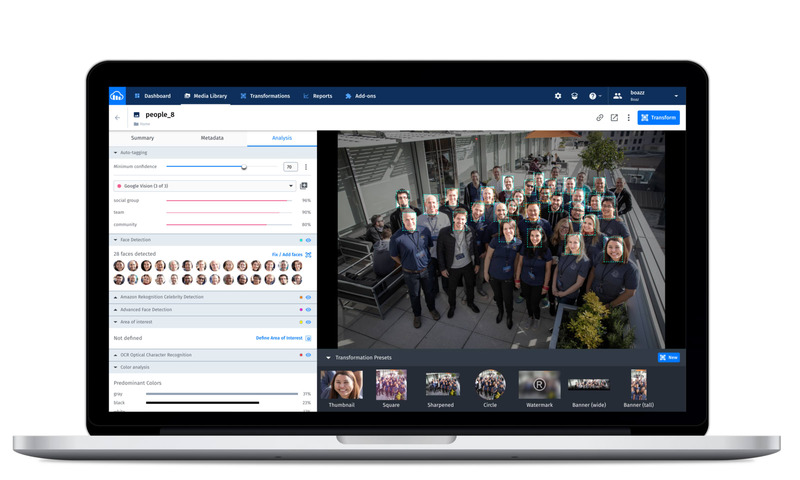 It will allow you to put more emphasis on how your teams work together, and to spend less time searching for assets and performing tedious manual work. It will leave you more time to focus on perfecting your visual story and making sure it's truly heard, and as a result, create the emotional connection needed to make your brand thrive.